Jan Estep, Are you there, Guanyin?, four-color offset print, poster, 2013. Are you there, Guanyin?, four-color offset print, poster, 20″h x 13″w. This poster accompanied my sound installation Are you there, Guanyin? which previewed in the “Sacred” exhibition at the Minneapolis Institute of Arts (MIA), August 31, 2013 through July 13, 2014. 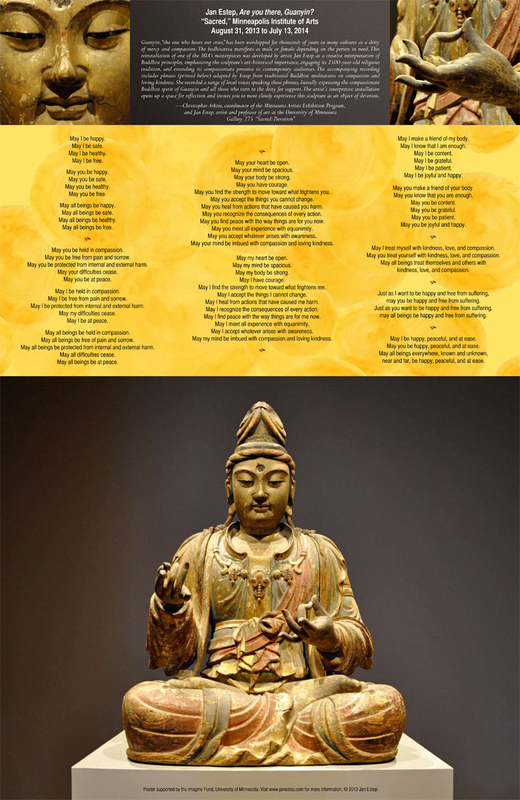 It showcases the beautiful eleventh-century Chinese Guanyin sculpture borrowed from the MIA’s collection and includes all of the meditation phrases spoken in the audio component. Guanyin is the bodhisattva of compassion and mercy. The poster was available free to visitors to the exhibition.